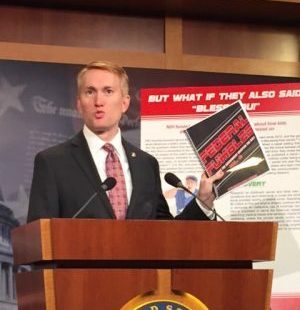 WASHINGTON – Sen. James Lankford (R-Okla.) on Monday chronicled $247 billion worth of questionable government spending levied on federal taxpayers this year detailed in his second annual report on government waste. Lankford said venues such as gas stations and convenience stores where SNAP benefits are often distributed need to contend with regulations requiring the sale of high-priced items such as goat-cheese, almond-milk, fresh shrimp and catfish. He said those regulations have resulted in many rural and urban venues refusing to provide SNAP benefits. Lankford described a $495,000 appropriation dedicated to funding a temporary exhibit that would allow visitors to experience scents and smells from the Middle Ages. He also mentioned that U.S. taxpayers were recently forced to fund “grave-digging in Iceland” to study that nation’s ancient cultures. Lankford said his report should not be considered partisan in nature, and that every administration has proven willing to engage in wasteful spending. Lankford said he has not released his report to the transition team of President-elect Donald Trump, who vowed to cut government waste during his campaign. He also said that he would be willing to challenge any administration that chooses to engage in what he believes to be wasteful spending. When asked about the fiscal viability of the Trump’s proposals to increase infrastructure spending and beef-up the U.S. military, Lankford said that careful oversight is necessary but that the proposals must be implemented. When pressed about Trump’s proposal to build a wall along the U.S.-Mexican border as a means of halting illegal immigration, Lankford suggested that the proposal has merit but said it is not a comprehensive solution.